At Sailfish Splash Waterpark we are proud to be a host site for The World’s Largest Swimming Lesson event in 2018. Join us on Thursday, June 21st, 2018 and help us try to break a record! 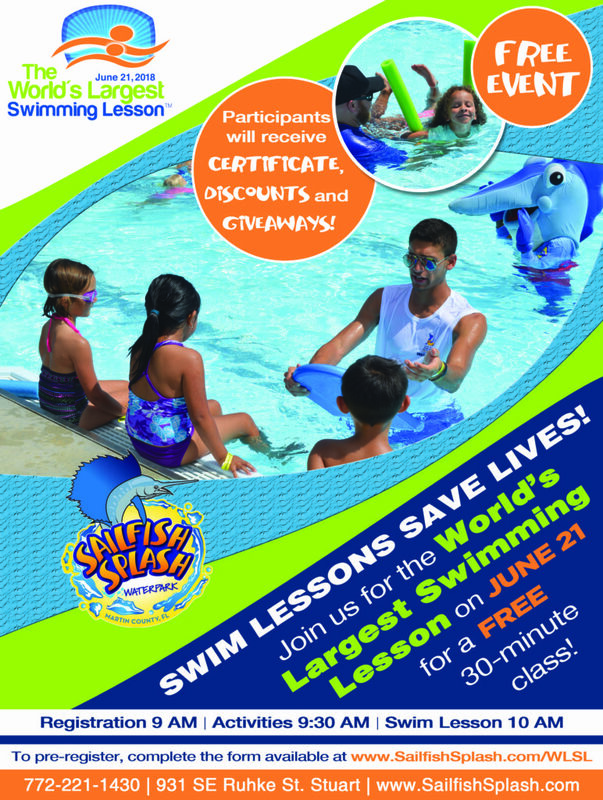 At this event participants will receive a FREE 30 minute swimming lesson! The event is open to the public regardless of age and participants will receive a certificate, giveaways and discounts at Sailfish Splash Waterpark. Expedite your registration process! To pre-register, visit www.SailfishSplash.com/WLSL, fill out the registration form and send it via e-mail at events@martin.fl.us or cmorales@martin.fl.us. Note: If you are a parent or guardian, please complete one form for every child who will be participating in the event. After the 30-minute swimming lesson, participants will have the opportunity to take a photo with our official mascot “Splash”! According to the Florida Department of Health, Florida leads the country in drowning deaths of children ages 1-4 years and annually in Florida, enough children to fill three to four preschool classrooms drown before their fifth birthday. Together we can help reduce the number of fatalities, join us at this FREE event, register now!